Indonesian students have gained an insight into Australian law through a program run with Charles Darwin University. CDU School of Law staff hosted 29 law students and three staff members from Gadjah Mada University (UGM) at Casuarina campus earlier this month. The students learned about areas of Australian law, including refugee, migration, constitutional, statuary interpretation and criminal law. 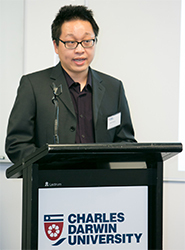 CDU law lecturer Danial Kelly said the program invited students to compare Australian and Indonesian laws. “The program has offered students excellent opportunities to gain greater awareness about how the law works in different countries,” Dr Kelly said. Darwin’s Consulate of the Republic of Indonesia hosted a reception for the UGM visitors. Consul Andre Omer Siregar acknowledged the cooperation between the two universities. Up to 10 CDU students attended a similar program at UGM in December last year, as part of the Australian Government’s New Colombo Plan.